Our neighborhood food experiences focus not only on the local food scene, but also what makes each neighborhood unique and special. Boston’s Chinatown is a small yet historically and culturally significant neighborhood in the city. 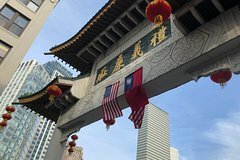 Brimming with delicious food tastings and fascinating stories, our Chinatown Culture and Cuisine Tour is one you don’t want to miss! We'll share the history of the development of Boston's Chinatown, as well as discuss the evolution of Chinese food in America and aspects of the cuisine that developed specific to the Boston area. Along the way, you'll have the opportunity to try traditional Chinese food specialties, Chinese-American dishes, and modern twists on traditional cuisine from 2nd generation Chef Owners in the neighborhood. We'll share the fascinating stories behind the people, the places and the food that make Boston's Chinatown the vibrant and tasty gem it of a neighborhood it is today! The food tastings on this tour have been selected with purpose, often in collaboration with the Chefs and Owners, to help tell a story about each of the eateries we visit.This tour is best enjoyed with an open mind and an adventurous palate. We look forward to seeing you in Chinatown!